Karndean flooring versilay system is a quick and easy floor preparation system that has acoustic and thermal insulation properties. It is a free floating, dual underlay system suitable for domestic and commercial use and provides a superior smooth surface ready to receive new floor coverings. The challenge: You have a new build fast track flooring project with tight deadlines. The solution: Versilay will give you a fast track acoustic floor finish with the ability to install floor coverings immediately, eliminating the costly drying time period associated with traditional floor preparation methods. The challenge: Multi occupancy refurbishment where sound reducing acoustic floor finishes have been specified. The solution: Installing Versilay in conjunction with your Karndean flooring, will give up to 22dB impact sound reduction and 58dB airborne noise reduction. The challenge: Client wants Karndean installed, but has electric mesh/net type underfloor heating system. The solution: Install Versilay directly over the under floor heating system and lay your flooring. Eliminate the need for expensive traditional smoothing compound setting of the mesh heating system and the drying time associated. The challenge: Client wants new flooring but existing floor is ceramic tiles. The solution: No need to go through the expensive process of removal. Install Versilay directly over ceramic tiles giving you the perfect surface ready to receive new flooring. 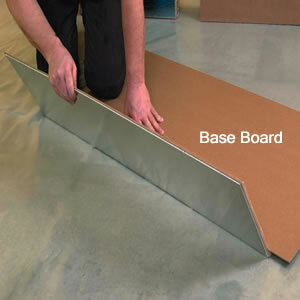 IMPORTANT: Polythene sheeting and aluminium tape must be used in conjunction with versilay (available below).